Project Elemental. Manual Turntable with cartridge. The new starting point to the extensive and versatile range of turntables by the Austrian firm Pro-Ject is a simple and yet ingeniously designed product that puts more than ever the magic of the vinyl record within reach of the new generations. 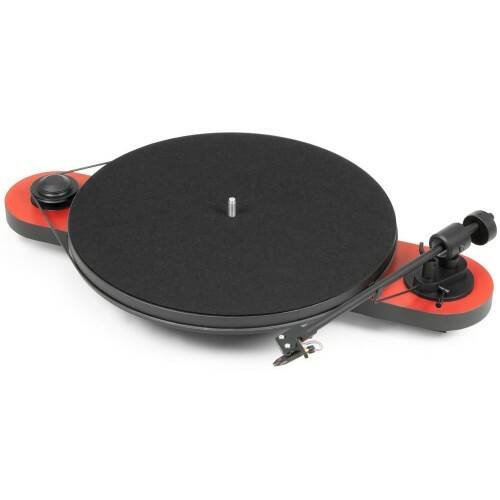 With a clean and simple design in which shape and function are perfectly integrated, the Pro-Ject Elementary is the quintessence of what a turntable should be designed in terms of high sound quality by combining a 30 mm MDF base Thick with a DC motor and very low vibration, an MDF plate with anti-resonant design and an all-metal arm in one end of which is a high-quality mobile magnet pickup capsule with factory-set key parameters . The result, possible thanks to the economies of scale that can be afforded by what is currently the world's leading manufacturer of turntables, is astounding in terms of harmonic resolution and tonal balance and absolutely incredible if we consider the price factor. Turntables of exceptional value for money. Belt drive with rotational speeds of 33 and 45 rpm. Equipped with an all-metal 8'6 inch arm designed and built by Pro-Ject. MDF base 30 mm thick. Continuous low vibration power supply. Supplied as standard with an Ortofon OM5 capsule with key parameters (support force and anti-skating) adjusted in the factory. RCA connectors and gold plated capsule connection pins. Dimensions: 430x90x300 mm (W x H x D).